I recently saw an advertisement for a typewriter on Kijiji… unkind, and mean spirited, though it was, it was nonetheless well-written. Basically, it accused any prospective buyer of this poster’s rogue typewriter, emerging from the recesses of yesteryear, clothed in a blanket of rust-like charm, of being a hipster. It suggested that all reasons for buying such a unit were ego-driven in nature, a slap in the face of today’s progressive technologies, and were symbolic of a holding onto yesterday for the sake of kitsch value. Now, I am uncertain of what circle of friends this poster keeps, nor why he could not see the bitter irony of his own diatribe’s ego-driven angst… all I knew was that it was not really about typewriters. Psychology 101 aside, why go to the lengths to write a venomous pitch to an audience you disparage? Perhaps, it is not to that target audience that this poster was really speaking. Regardless, the ad is still up. I discovered typewriters this year. I cannot explain their appeal. For it is really (ultimately) not about them. They, like anything in life that draws us in, are mirrors for something inside of us that we are opening up to – that we are getting in touch with. A typewriter is a vehicle for being present with that. It is a vehicle for an interactive experience of self, unencumbered by the multi-focus demands of digital media. I am not opposed to digital media, nor technology as a whole. But I don’t wish to view it as a lifestyle. Rather, I feel it is a tool. Much like a painter’s brush. However, if I become more focused on the myriad forms of brushes and their like, I may be missing the point that I am supposed to actually be painting with it…at some point. Don’t get me wrong, I am grateful for the digital brush. But that is as far is it needs to go. 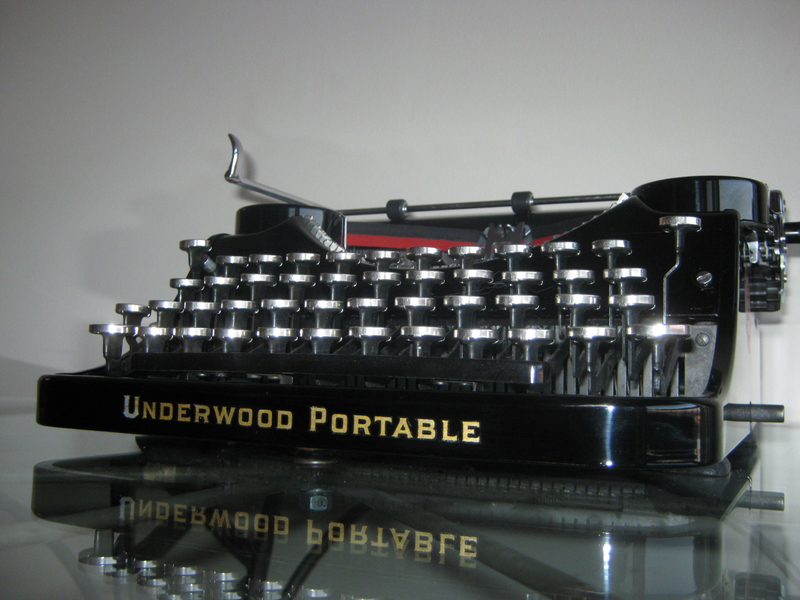 As a writer, typewriters demand a whole new level of attention and presence, as a vehicle of one’s expression. I interact with the beautiful ole machine in ways that the digital domain does not afford. I still use ‘things digital’. I am clearly using it now. It is useful…as a tool. But artfully expressing my writing using digital media will always be fleeting, at best. It is like a loud guy at a networking function, constantly seeking my attention (even if he can tell me where the drinks and best hors d’oeuvres are). I don’t know if I will produce something that will ever be considered a piece of art on a typewriter… but writing on a typewriter… is art in itself. There’s something in the discovery of self when I type on a beautiful, manual machine. At least when I type on a typewriter – as a physical extension of my very self – I know it’s listening, unconditionally. And I know I am writing, without condition.